27/43 Kim Hollis It starts off being kind of engaging, but goes to a bad place. I love the kid who played Murphy, though. 71/98 David Mumpower Enjoyable first hour falls apart completely in the end. This is the forgotten 2008 Robert Downey Jr. release and rightfully so. 121/196 Max Braden Yelchin gives it his all, but the movie is just so-so. I liked how subdued Robert Downey, Jr. was. Teenage alienation has always been one of the top subject matters in cinema. Whether Pee-Wee was trying to get girls to accept him long enough to get laid in Porky's or Sandy Olsson was able to find companionship in a new town in Grease, the theme has always been the same. It's hard to be the kid in school that nobody likes/knows. Charlie Bartlett is the latest variation on this theme. The film tells the story of Charlie, a pedigreed young man who has trouble fitting in at the public schools his mother wants him to attend. After being kicked out of one for making fake IDs, the socially awkward teen finds himself facing the triple threats of therapy, Ritalin, and public school. It's debatable which of these is the most troublesome to him, but none of them is welcome…much like the boy himself. You see, Charlie Bartlett is not unlike Arthur "The Fonz" Fonzarelli in one way. Both of them choose to do their business in the men's room. No, I don't mean that type of business. I am referencing the way that each of them utilizes the privacy of these areas to have heart to heart conversations with their associates. In the case of Fonzie, everyone already loved him, so the process was irrelevant. 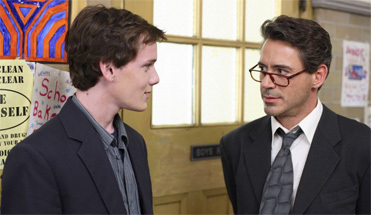 Charlie Bartlett is not quite as fortunate. In point of fact, his early days of public school lead to his being on the receiving of an unsanitary toilet dunking in said bathroom. Over time, however, he starts to give advice to his classmates, becoming a de facto school therapist for those struggling, confused teens. Over time, Bartlett grows to be one of the most popular, reliable people in his school due to the fact that he is willing to do what few adults like teenagers enough to do: listen to them. Even though he's only an amateur therapist, he does a better job than the actual school counselors because he empathizes with what his classmates are struggling to overcome.